It’s customary every six months for Squared Away to round up our readers’ favorite blogs. The following were your top picks during the first six months of 2015, based on an analysis of online page views. To stay current on blog posts in the future, click here to join a once-weekly mailing list featuring the week’s headlines on Squared Away. Baby boomers face a Catch-22. Many boomers will have to stay employed longer than they’d hoped to close the gap between what they’ll need in retirement and what they can realistically afford. Yet the job market is tough for job-hunting older workers, and if they are employed, wages stagnate or decline when people get into their 50s. A new report by the AARP Public Policy Institute shows the continuing toll on workers ages 45 and older who have suffered a bout of unemployment since the onset of the Great Recession. Lower pay, fewer hours, or more limited benefits in their new jobs and a prolonged inability to find any job are plaguing these workers. AARP found that only half of those hit by job losses have found work, and the rest either remain unemployed or may have given up and dropped out of the labor force entirely. AARP’s representative survey of some 2,500 older Americans, conducted late last year, aligns with earlier academic studies looking at the Great Recession’s impact on older workers. The youngest boomers are now 50, so the survey includes some people in Generation X. The “longevity economy” (i.e., aging baby boomers seeking long lives) meets “the quantified self” (tracking everything we do online) in the above video about technologies that help aging boomers stay fit. The PBS video shows off some of the products being developed to cater to an enormous market of some 100 million Americans over age 50, who are spending about $7 trillion per year. Products include a treadmill desk, technology that reveals sleep patterns, and fitness watches measuring everything from blood pressure to how many steps are walked daily. Americans once defined success mainly by whether they owned a house or were better off than their parents. Today, it’s a debt-free college education and a comfortable retirement. U.S. adults feel that their top indicator of financial success is having enough money in the bank to retire (28 percent of adults), followed by sending their kids to college without having to borrow to pay for it (23 percent), according to a telephone survey sponsored by the American Institute of CPAs. Homeownership and upward mobility each came in at a distant 11 percent of the adults, age 18 and up, randomly surveyed by Harris Poll. 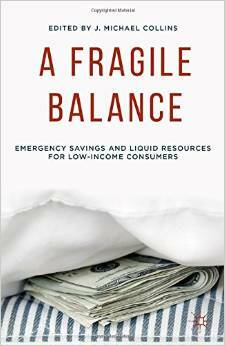 Several new books are pertinent to topics frequently covered by this blog. Three worth noting are about low-income savers, older workers, and small employers with retirement plans that are overdue for an upgrade. For low-wage workers in fast food, retail, and similar jobs, just finding enough money for living expenses is like squeezing blood from a turnip. Research shows that many want to save, and the absence of this backstop only increases their financial fragility. The default is often to resort to high-cost debt, which further confounds their ability to pay the bills, much less weather the next emergency such as a car repair. Here’s a sobering thought: by the time most workers get into their 50s, their earnings are declining. Although older workers don’t necessarily see smaller paychecks, their earnings are effectively shrinking, because they no longer keep up with inflation, according to a study charting the inflation-adjusted, or “real,” earnings of some 5 million U.S. workers over their lifetimes. The first decade in the labor force, between ages 25 to 35, is crucial – that’s where the wage gains are concentrated, the researchers find. Real earnings plateau sometime between 35 and 45, and this plateau occurs earlier than previous research had indicated. 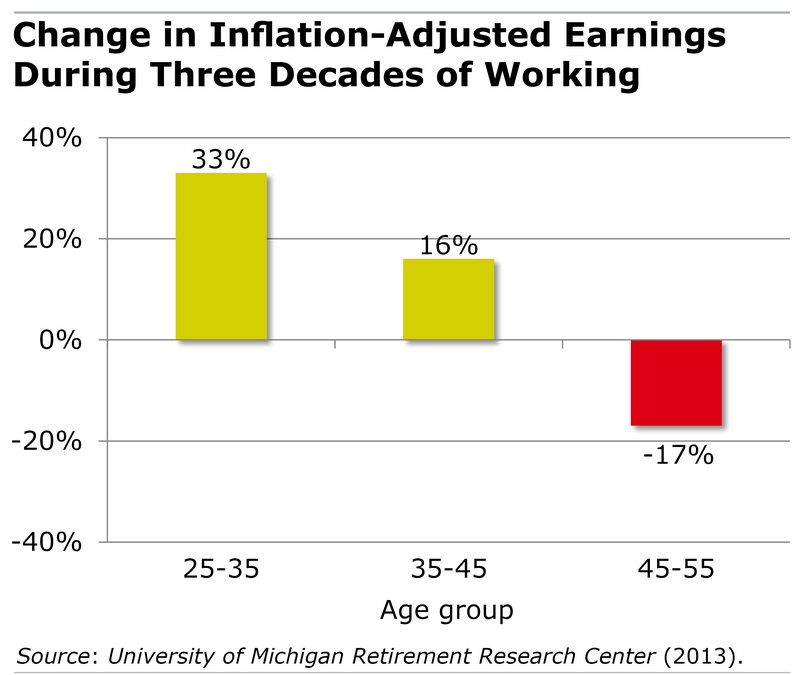 By the time most people move into the oldest age group in the sample – 45 to 55 – their earnings are falling. The chart below shows the percentage changes during three discrete decades in the labor force for people whose earnings are in the middle of all U.S. workers’ earnings. For the 45-55 age group, other data in the study pinpoint the earnings decline as actually beginning around 50. Economists have been refining their analyses of lifetime earnings patterns for decades. The researchers’ methodology improves on past techniques and then applies it to an extremely robust data set: the Social Security Administration’s earnings records for U.S. workers from the 1970s through 2011. Great news for older workers considering a career change – those who’ve done it are happier and less stressed. People who attempted a career change sometime after turning 45 were surveyed last year by the American Institute for Economic Research (AIER) in Massachusetts. Whatever the reason for making a change – voluntary or forced – the majority of those who did so felt their results were successful. These late-career changers need to be put in a larger perspective. Older workers are much more likely to stay put in a job than are younger people moving up the ladder, and older people also have a tougher time recovering and finding a new full-time job after becoming unemployed. But when older workers can change their employment, the outcomes are positive. “I feel like a new person” – 72 percent of job changers agreed with this statement, while 65 percent said their stress levels fell, according to the AIER. There are also downsides to late-career transitions: a hefty minority of those surveyed advised others taking this path to be open-minded about their working hours and lower compensation, though half of those surveyed said their pay eventually increased in their new jobs. “If you feel you need a change, then do it,” one survey respondent commented.